Detached Villa, 2 heights, 1563 sqm constructed area, surrounded by 24061 sqm of orange trees. 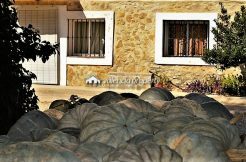 Located in Alcudia de Crespins, a town on the left bank of the Cañoles River, at the entrance of the Montesa valley, facing the Vernisa mountain range, 9 km from Xàtiva. From Valencia you can access through the A-7. It is a population that has a railway station on the C-2 line. Access to the property is via paved road, and is within walking distance of the village. The built area of the plot is 1563 sqm and it is distributed throughout the complex, ie: the main building, the fronton court, the tennis court, a large pool area (with swings and springboards), and the garden. Surrounding the entire complex, there are two extensive orchards of orange trees, 11835 sqm to the west and 12226 sqm to the east. The property, divided into two levels, has on the 1st floor: 4 double bedrooms, living room, dining room, winter room, 2 bathrooms, kitchen, hall and porch. And on the ground floor has: 3 bedrooms, kitchen, bathroom, storage and garage with two independent doors. A property with a huge living space, multipurpose use, transformable into two houses or a home plus business. It needs to be updated in some respects, but they are not jobs that involve excessive investment. The orange trees are in production and from which a small annual income is obtained. In short, a property that offers many possibilities.